Every now and then an iPhone app comes along that opens a door of possibilities for future applications. Realmac Software’s app, Clear, could do just that. Clear fully utilizes the gesture capabilities of the iPhone by providing an interface that revolves around swiping rather than tapping. With a very simple and clean layout Clear provides the most straightforward layout for a to do app to date. In order to switch from your lists to all you need to do is swipe up. To mark something as complete simply drag it to the left or drag to the right to delete it. If you would like to add another task just pinch your fingers outward. Clear’s design, shaping their interface around gestures rather than buttons, could be the first of a wave of apps changing the way we work. While it does take a little getting used to, it is not hard to pick up on the gestures to use Clear properly. After playing around with it for five to ten minutes it is easy to pick up on and you find yourself wishing other apps implemented use of gestures as well. 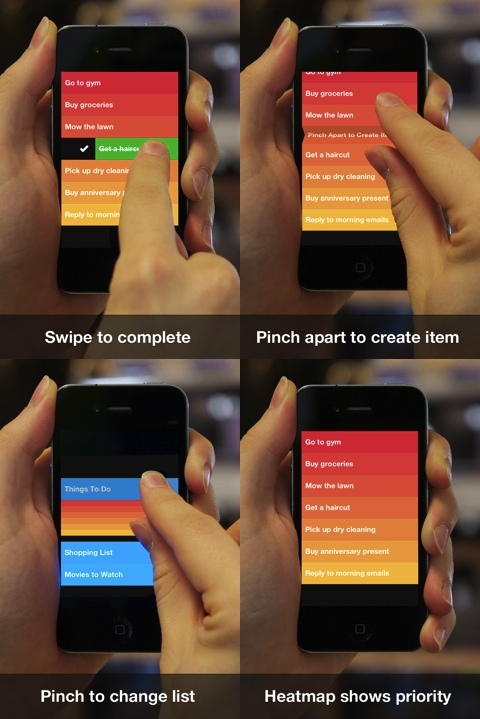 You will want to finish all of your tasks for the satisfaction of sliding it off the screen after completion. Clear allows you to move the items on your to do list around, so that you can put them in order form most important to least. The items at the top of the list are in red and the colors of the items gradually turn yellow as the priority decreases. For someone looking for a to do list app that includes calendars and reminders, Clear is not a fit. It is a straightforward application that only allows you to add a item to your to do list or remove one. If you are looking for a productivity application that does use reminders, Wunderlist could be a good option to try. Clear currently sells for $0.99 in the App Store and a great way to simplify and organize your tasks. I give it four stars for providing a clever to do list application as well as possibly pioneering a new generation of apps. AppSafari review of Clear was written by Laura Zito on February 21st, 2012 and categorized under App Store, Featured, Notes, Productivity. Page viewed 6530 times, 3 so far today. Need help on using these apps? Please read the Help Page.